Polyclonal anti-RFP is designed to detect red fluorescent protein (RFP) and its variants: mCherry, tdTomato, mBanana, mOrange, mPlum, and mStrawberry. This product is prepared by labeling high quality polyclonal rabbit anti-RFP antibody with our exceptionally bright and photostable CF® dyes. 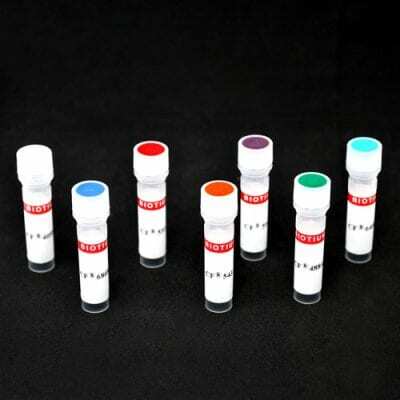 Polyclonal anti-RFP is designed to detect red fluorescent protein (RFP) and its variants: mCherry, tdTomato, mBanana, mOrange, mPlum, and mStrawberry. The antibody was prepared from antiserum to RFP (Discosoma). This product is prepared by labeling the high quality polyclonal rabbit anti-RFP antibody with our exceptionally bright and photostable CF® dyes. CF® dyes offer exceptional brightness and photostability. See the CF® Dye Brochure for more information. See our full selection of anti-tag and anti-hapten antibody conjugates.